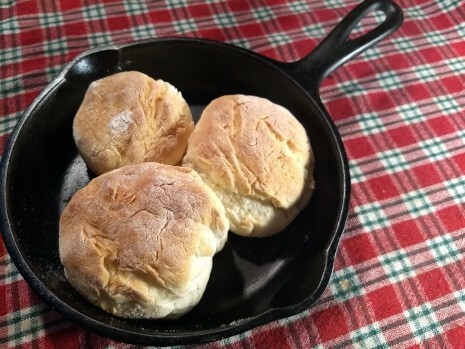 I grew up in North East Texas where biscuits were a part of nearly every meal and we ate them with everything. My grandmother made a killer Biscuit Pudding and to this day, I haven’t found a replica, and all my tries are proving fruitless. Or pudding-less, as the case may be. If you’ve been lucky enough to have tried (or made) biscuit pudding, let me know your recipe in the comments below. But I digress. Let’s talk about reheating biscuits, because face it: We can’t eat them all at once, and who only bakes two at a time? Cold biscuits are firm because the fat in the recipe becomes solid with the drop in temperature. As you reheat biscuits, the fat melts, returning the tender crumb to its normal, soft state. With too much heat, however, the edges are susceptible to drying out and becoming too tough to eat. Keep checking as you reheat biscuits, and make sure they are completely covered. If you find that you reheat leftovers in the microwave more often than not, we found these nifty reheating bowls with attached lid and clips and easily vents. Comes in pack of two. It’s important to note that you should reheat immediately before serving, or they will dry out and get hard after about 20 minutes of cooling. Inspect your leftover biscuits. If you’ve stored them properly in an airtight container, foil, or baggie, they should be fine. But still—make sure they haven’t molded or gotten wet before you take the time to serve them again. Remove the biscuits from their container or wrapper. You can use any fat to coat the top of the biscuit, but a deeply flavored one will make the biscuit flavor pop. One teaspoon per biscuit: melted butter, pour out coconut oil, olive oil, or nut oil into a small bowl. 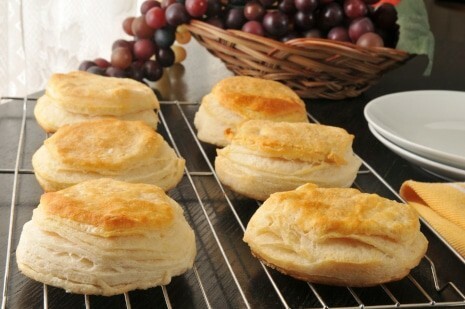 Using a pastry brush or back of a spoon, coat the biscuits lightly with liquid fat. This will keep the biscuits from drying out in the heat. Wet a clean kitchen towel with water and wring it out so that it isn't dripping wet but still rather moist. Keep them really moist. They dry up so fast from the high, uneven heat. Don’t heat them for too long. It just kills the tender crumb. Place your biscuits in a microwave-safe container without the lid. We prefer glass but you can use plastic. Do not stack your biscuits. Instead, lay them side by side without the sides touching. Place the moist kitchen towel over the container. Depending on your mike’s power, the size of your biscuits and how many you are reheating at once, start with 10 seconds for one biscuit, and 45 seconds for six biscuits. 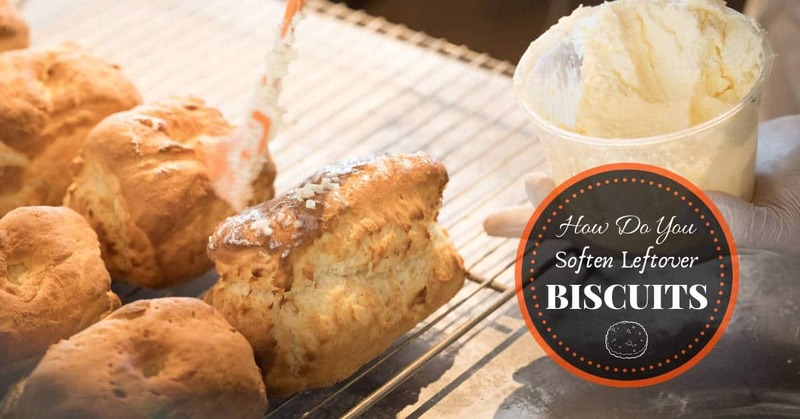 Check biscuits for softness and serve right away. They cool quickly and are practically inedible after being nuked once cooled. We found a four-star microwave that WORKS WITH ALEXA for $60. Color us impressed! Alexa has become quite the sidekick in our kitchen for setting timers, finding recipes and reordering pantry and kitchen items. We like having that extra “hand” so being able to set a microwave with Alexa seems pretty cool to me. Reheating biscuits on the stovetop can be a great way to reheat those biscuits and still keep them moist. While our process below calls for wrapping them in tinfoil you can skip that if you don't have an iron skillet. If you don't wrap the biscuits in foil, just make sure to flip the biscuits about every 20 seconds. It is important to keep flipping them so that they don't become crisp. The goal is to slowly warm them up. 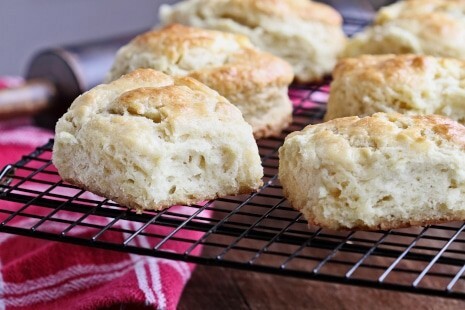 After coating biscuits with melted butter or oil, wrap them in aluminum foil. Place the foiled wrapped biscuits in the pan. Allow the biscuits to heat up for 1 minute. Flip the biscuits and allow to heat for 1 minute. Remove biscuits from the pan and carefully unwrap the foil. Be careful because the foil may be hot. Note: Desired temperature personal preference. If they aren’t warm enough for you, re-wrap them in the foil and place in pan on low for another two minutes. ​Some would argue that reheating biscuits in the oven is the best method and I tend to agree. For me, it is a lot like the difference between an oven baked potato and a potato baked in the microwave. I will eat either potato for a simple dinner but the one slow-roasted in the oven will always taste richer. That is how I feel about reheating biscuits. Prepare your biscuits per the steps above. ​Place the biscuits on a baking sheet. Tip: We love to use silicone baking mats to prevent sticking and for easy clean-up. Heat biscuits for 5 to 6 minutes. Serve right away while hot! Use the same instructions as for a regular oven but increase the heating time by a minute for all. You may want to reheat fewer biscuits at a time. I’ve never been a huge fan of a toaster oven because it takes up precious counter space, but it does some of what a big convection can do and saves energy too. If you’re in the market for a toaster oven, America’s Test Kitchen recomme​​nds this one with all the bells and whistles. How to reheat biscuits without making them hard? 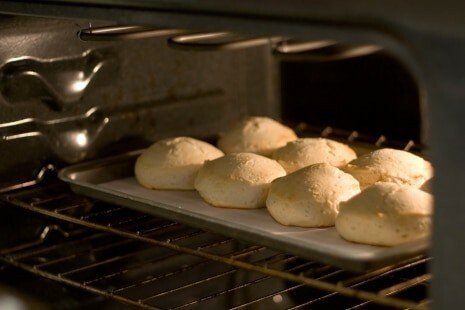 ​There are two tricks to keeping biscuits moist when you reheat them. Wrap the biscuits in a moist paper towel or kitchen towel prior to reheating. Cover the container itself with a moist kitchen towel while reheating in the microwave. Brush the biscuits with melted butter or other fat prior to reheating. Tip: No matter what method you use to reheat biscuits, don’t overheat them. Keep checking temperature after a few seconds in the microwave and after every minute on the stovetop and every three minutes in the oven. Microwave on defrost (30% power) for 1 minute 30 seconds or until thawed. Turn sandwich over, microwave on HIGH for 55 seconds or until hot. Let stand in the microwave for 1 minute before serving. Microwave on HIGH for 50 seconds or until hot. I didn’t used to have the patience to let food “stand” in the microwave. To be honest, I’d often forget it was there. But it is part of the cooking process to help avoid overcooking foods with high heat. The residual heat permeates the food, and it finishes the cooking process. I prefer to leave mine out to thaw before heating for a more even heating because I don’t like messing with the defrost setting on my microwave. (That takes all minute!) We would also add to run the paper towel quickly under the running faucet then COMPLETELY en-robe the sandwich with it, otherwise the edges are exposed, and these need moisture as much if not more than the rest of the sandwich.